5+++++ 'You marked my soul.' Stars. When a person is ready to fall in love, it happens fast. There's no looking back or in between to find the empty space where water can put itself or freeze, to crack the two of you apart. There is no void. There's no weighing of options or analysis of pros and cons. Everything is reduced to feelings and emotions and actions that don't need explanations or justifications. I felt it with Adam that first night, if only for a second as we stood outside of my building. It doesn't always feel like this, it doesn't always feel easy or right, so when it does feel this way, you have to seize it. Love is a wordless secret; it's an inside joke. Only the two of you have to understand it. A bit lost in life, a drift in matters of the heart, and unknowingly exceptional at self-sabotage, Charlotte Martin is in a major rut. Her story is an emotional roller coaster ride from start to finish; one of love, loss, soul mates, and discovering her self worth and just how precious life really is. With an amazing best friend and supportive family at her side every step of the way, she's never alone even when she thinks she is. Many lessons can be learned from her inner will and strength and it was to easy to fall head over heels in love with every single aspect of this story. So many beautiful things happen between the covers of the unforgettable book, ones that need to be experienced first hand. 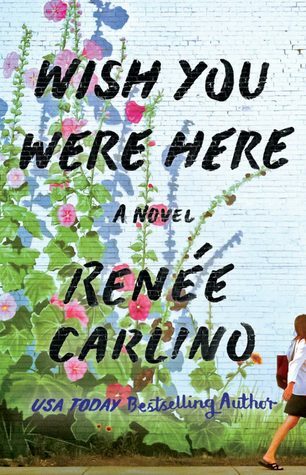 If you read only one book this year, do yourself a huge favor and dive head first into Wish You Were Here! Carlino has a knack for eloquent storytelling, combined with such rich, vivid depiction, providing the reader with a truly ethereal and realistic experience. No questions are left unanswered while merging the celestial and human realms throughout this book. Renee Carlino has generated a refreshing worldliness to her works with the addition of Lucian Divine, in what I like to call paranormal infused contemporary romance. You seriously cannot go wrong by indulging in the heavenly prose within. This is an unforgettable story, one so truly breathtaking, heart warming and soul crushing, with many lessons to be learned. This story will consume and own you. Everything combined makes this hands-down her best work to date! There are so many layers to uncover and be revealed in Lucian Divine. This is a story that will open your heart and expand your mind. 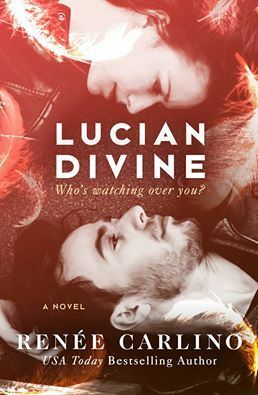 Delivered in such a way that you cannot help but fall in love with not only Lucian and Evey, but all the supporting cast of characters. Who knows, that little 'loop-de-loop' might make you fall in love with "the big guy upstairs" as the most heart warming and awe striking finale is played out. Yeah, I had to pick my jaw up off the floor! Gah!! It was just so hauntingly beautiful!! Every so often you discover and author, one whose works resonates with you. Time and time again, book after book. Each taking you on a profound journey so poignant and moving that you're lost for words. Your heart will ache, yet by the end of the book your heart will feel so full--as if it's about to burst. 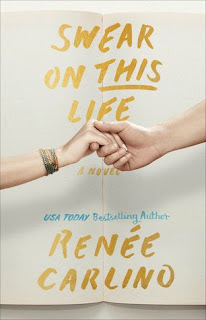 Every one of Renee's books has left me reeling and longing for more. Swear in THIS Life is unlike anything I've ever read before. Such a unique story line and delivery, rich with characters and ALL.THE.FEELS! So much heart and soul went into this book hangover inducing composition, making it not only one of my top reads of 2016 but one of my all time favourite books. EVER. In my opinion SOTL is Renee's best work to date. This exquisitely captivating read definitely is in a league of it's own! Jase and Emi's story is one of survival, love, friendship and forgiveness. A deep seated bond between two kids, separated for 16 years. Swear of THIS life is a book I'll never forget and will always think of whenever I pass by a dirt road--a dirty, dusty, and muddy dirt road. A road that will -always- lead home. Renee Carlino, you have done it again! You captured my heart and held it in the palm of your hands right up until the final page. You made me cry, you made me laugh, and you simply took my breath away. Your writing in Swear On This Life was beyond exquisite. This story is so uniquely written. I’ve never read anything like it before. It was really a love story within a love story. It had amazing characters and heartfelt warmth. Have you ever wondered what your life would have been like had you taken a different road? Ever wondered what happened to the one that got away? What if you could get a glimpse of what your future might hold? If you've ever asked yourself either of these questions, this is the book for you. Jase and Emiline are just kids when they meet and become best friends. Swear On This Life takes you on a journey throughout their lives and into adulthood. It will enchant you from page to page, you won’t be able to get enough of it. It’s a very powerful, poignant and touching read. Definitely one of my top favorite books of 2016! OMG!! OMG!! Wow!! Renee Carlino outdid herself with this gem! Before We Were Strangers is definitely in my top 5 books of 2015. It's such an AMAZING book with an original and unique concept that made me fall in love with this second chance romance. It was refreshing and definitely stuck out amongst the books I've read this year. This story owns a piece of my heart, I'm so in love with everything about this book!! From the cover (which I absolutely love), to the title and the all intriguing blurb, this book is certainly out to grab your attention. Before we were strangers was written in such a way that I felt as if I was living the pages of Matt and Grace's life. With a back drop of NYC and having traveled there myself, the book became just that much more realistic and relate-able for me. "Time is the currency of life" -- "time passes, life goes on, places change, people change.."
Matt and Grace's story is one that I'll soon not forget. From their friendship, to the love they have for each other, the highs and lows, past, present and future- they have a connection/bond of sorts that's simply unbreakable even after a decade and a half. The myriad of emotions their story evoked was an experience in itself. I laughed, I cried, swooned, had my heart ripped to shreds, broke out in chills and in the end-- my heart melted into a sweet mushy pile of HEAness. It has ALL. THE. FEELS!!! Oh My GAAAAWD! I LOVE THIS BOOK!!!!! You can't go wrong when you pick up a Renee Carlino book to read. Each of her stories takes on a life of its own and will consume you to the very end, leaving you with one heck of a book hangover and begging for more. This is one book I wish I could go back and read again for the first time. 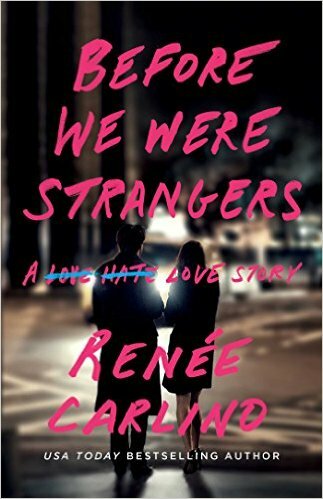 Before We Were Strangers is an incredible love story. It is beautifully written and in my opinion flawless. These two characters were just so loveable. Matt & Grace’s story spans several years. It starts when they are in college and finishes up when they are adults. From the moment they met I had butterflies in my stomach. You could just feel the pull they had to one another and I loved their flirty, fun, sarcastic friendship that was full of unexpected things. As the years pass by there is a lot that happens between these two and to these two characters. There is some heartbreak and manipulation along the way that will affect both of their lives but the one thing that doesn’t change over the years is their love for one another. That never goes away and years later when their friendship renews all the butterflies come back. I loved that this was a friends to lovers and a second chance romance story all tied into one book. Both of those are my favorite kind of books to read and this one was a treasure with both. I really could not have asked for a better combination. The characters were very well developed and had real problems going on in their lives. This book was just a breath of fresh air for me to get lost in. Renee Carlino was a new Author to me prior to reading this book and I can honestly say she now has a new fan. You will want to make sure you don’t miss out on getting this book, It will definitely be on my top reads list of 2015.